The legendary Sunderbans tigers have lost their punch and ferocity due to less access to prey and are being more prone to weak hind legs which are visible due to the abnormality in their movements. The reasons attributed to this weak mobility in the tigers are injuries from the breathing roots cannot be ruled out and the major cause could be low prey density and with human presence in the vicinity, the tigers have developed a tendency to stray outside the jungles. A recent survey and research by the Wildlife institute of India clearly concludes the low prey density in Sajnekhali area of the Sunderbans in West Bengal, India. The recent seizures of traps, laid to trap the poach deer, confirms the fears about how the low prey density is affecting the tigers in the Sunderbans. It seems that the big cat might soon lose its hunting skills. 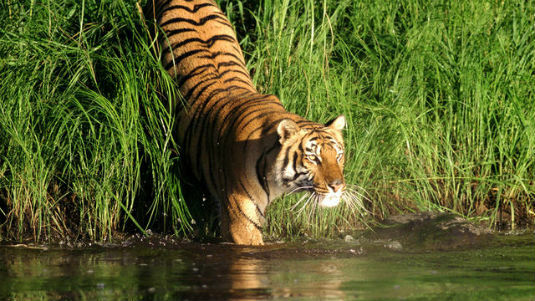 The behavior patterns of tigers in Sunderbans is a matter of grave concern for wild life lovers. Vets and researchers are trying to study wildlife A to Z in order to come up with a solution to this strange and unfortunate issue.